Thanks for your comments on Monday's post. It's easy to forget that running ruts are just that -- a rut that eventually goes away. It doesn't help when all of your running has been a rut, but I'm sure that's partly my own fault. Setting a tiny goal should help keep my focus, and eventually I'll figure one out. Any thoughts? Day two of my week of 4 milers ended with success. I felt a tiny bit weird the first half mile, but settled into a nice rhythm ('rhythm' is an awkward word). My pace averaged out to 9:50 minute miles, which is just fine since I'm keeping an even intensity. I always speed up the last mile, but not to a sprint pace. 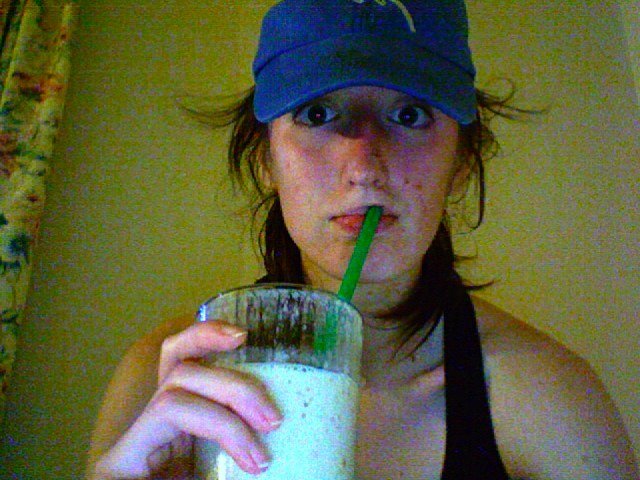 Then I came home and drank a smoothie. I have a giveaway for you folks. I contacted the Larabar people and inquired about a review. They also offered to give 6 bars away to my readers. You've all heard about these, so I'm not going to explain the concept except to say it's like eating dried fruit and nuts, without all the chewing. The bars are flavored with natural ingredients, like unsweetened coconut and extra virgin coconut oil. I ate the coconut cream pie and declared it my favorite. The coconut flavor shone through and it reminded me of scooping the white layer of coconut from the can of coconut milk. 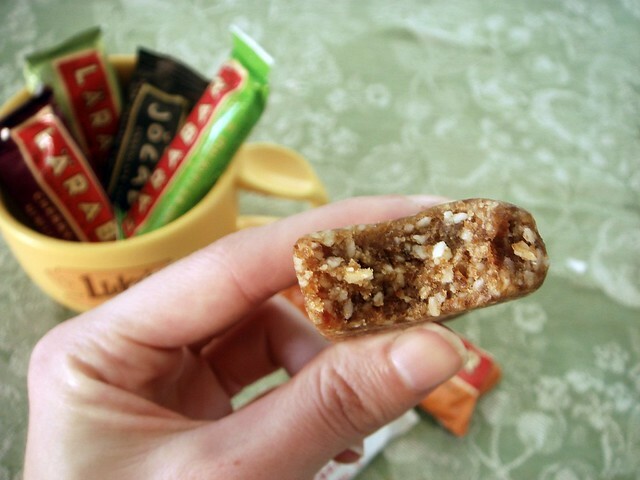 They're not sticky or excessively chewy, and they're the perfect pre-run snack. I like that they're about 200 calories because that seems to keep me filled without being too much. I'm usually better on a near-empty stomach, but if I'm running more than 5 miles and need a little fuel, I have a banana. 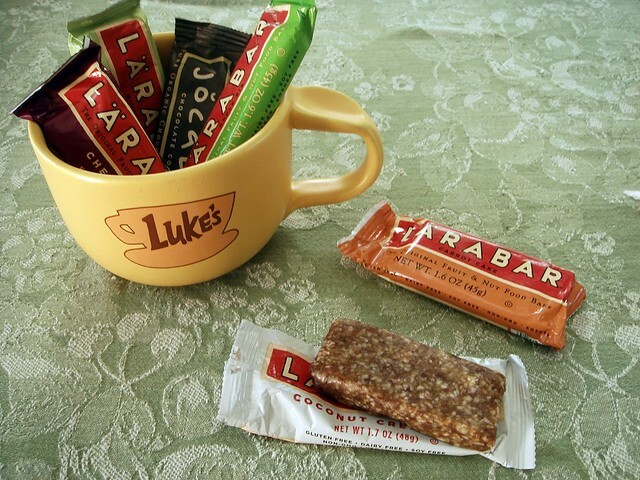 I usually go with fruit before a workout but larabars used to be my pre-long run meal of choice! Luurrvvee them. I remember when I first started running again after my last stress fracture, it sucked so much that I wondered how anyone ever started running and kept at it. I mean...at least I KNEW somewhere in the back of my head that it would get better! Hopefully your next run will be even more rock star! Pre-long runs I usually eat a pb & j sandwich. 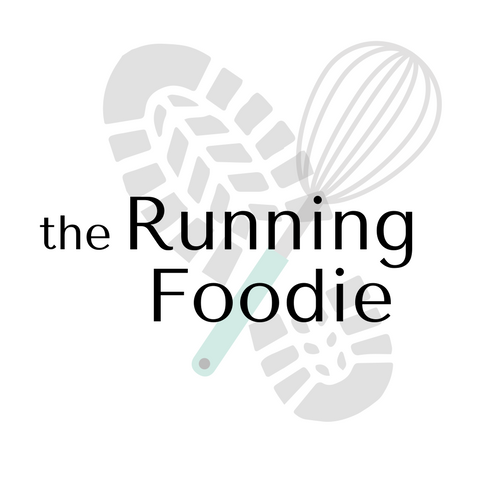 When I run in the morning during the week, I usually don't eat anything unless I wake up really hungry! I like having a nice fruit smoothie, it tastes great, provides nutrients, and doesn't way me down!